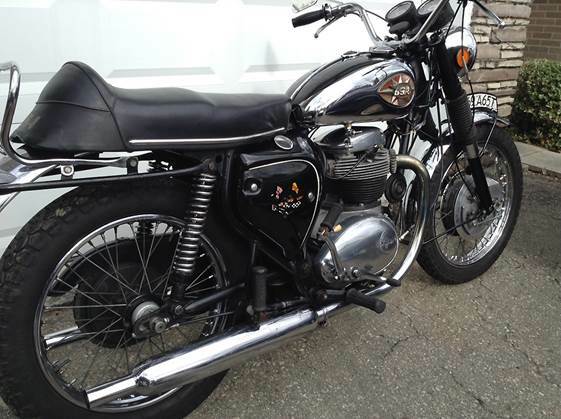 Offered for sale is a running 1969 BSA Thunderbolt A65T. This is a 650cc machine. The condition is very good for a 50 year old motorcycle. This classic Brit bike has matching serial numbers with no operating issues, and has a nice aged patina. This bike has been well taken care of and never abused nor mutilated as so many old classics have. It is in its original state and runs very well. The motor has been refreshed with +20 over pistons and new rings. It has also received new crank bearings, shells, rod bushes and timing side bush with a full motor inspection and rebuild. The machining for the motor was performed by Gord Bush, machinist extraordinaire of GORD BUSH PERFORMANCE. Gord has been building race engines for over 30 years. It also includes some tasty upgrades in the form of a cast iron oil pump, an in-line oil filter, a modern sump plate with magnetic drain plug, an oil pressure gauge with steel braid line, and a SparkBright Eclipse battery charge indicator light, which monitors the battery voltage. The ignition has also been upgraded to a Tri-Spark electronic unit; the best in the business. I should also mention that the factory released Thunderbolt came equipped only with a Speedometer. A tachometer drive, instrument holding bracket, and tachometer gauge were added during the years of my ownership. The tires are in great shape too. Like new - you can still see the nubs. This moto will pass safety certification with no issues as all the lights and horn function as they should. The wiring harness is also in very good condition. This is a good example of a cherished British motorcycle from the glory days of motorcycling and is now considered a vintage classic with a soulful lineage and a hundred years of history. This bike has a clear title with ownership documentation owned by me. If you've ever entertained owning a classic Brit bike with lots of soul this is a great one to consider. You can ride as is, or restore it to its full glory. Don't miss out on this classic piece of motorcycle history. Photos have been added below for your consideration.